11.05.2013: Monza – Qualifying Practice 2 & Superpole. Weather conditions: Sunny. Monza – Qualifying Practice 2 & Superpole. 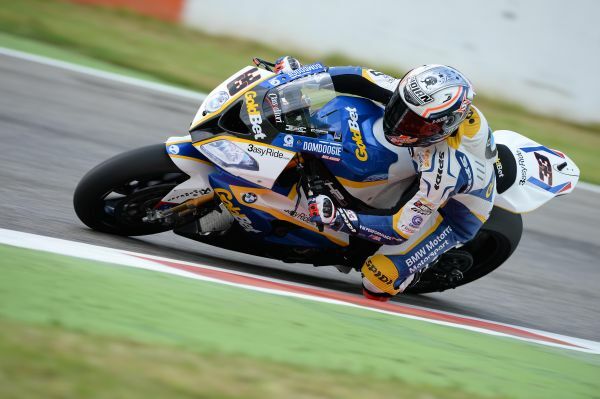 The BMW Motorrad GoldBet SBK Team experienced a thrilling Superpole qualifying in Monza (ITA). In a nail-biting session, both factory BMW S 1000 RR riders went through to the deciding Superpole 3 session. Local hero Marco Melandri will start the fourth round of the 2013 FIM Superbike World Championship from fifth place on the second row of the grid. His team-mate Chaz Davies (GBR) qualified ninth and will start on the third row. While Chaz had an easy progression through the first session directly to Superpole 2, it was harder on Marco’s side of the garage. An electronic issue prevented the Italian from going out on track straight away. His crew did a great job to resolve the issue within shortest amount of time and sent Marco out with five minutes to go. The Italian’s time was good enough to proceed to Superpole 2. There, both riders again opted for race tyres. Marco did one outing and finished eighth, Chaz went out twice and finished seventh. With the fastest nine riders qualifying for Superpole 3, both riders reached the final session and opted for qualifying tyres. Marco did two outings and rode the fifth fastest time. Chaz went wide in the chicane, meaning his first lap time was deleted. He stayed out on track and rode more laps on the now used qualifying tyres and as a result finished ninth. In the 2013 FIM Superstock 1000 Cup, championship leader Sylvain Barrier (FRA) will start the third round of the season from pole-position. After being fastest in yesterday’s first qualifying practice on his BMW HP4, the BMW Motorrad GoldBet STK Team rider set a clear best time again in today’s final qualifying session., setting a new track record for the Superstock class. His team-mate Greg Gildenhuys (RSA) improved several positions from yesterday and finished in seventh. “I am quite happy with today’s Superpole. We know that we are a little bit slower in qualifying sessions, so to start from the second row is a good result. I am really satisfied with my RR; especially with the front. We just need to work a little bit on the rear. “This morning, I was not really satisfied with the bike. For the afternoon we made some changes and I was much happier. On a race tyre I went 1.3 seconds faster than in the morning which was a big improvement. But I was still struggling with the balance of the bike at the corner entry, this combined with the increased grip of the qualifying tyres meant that the bike became too nervous. “It was quite a positive day, despite the fact that we had some troubles. Marco had a very good session this morning, even if the lap times and positions did not change because the track was slower. In this afternoon’s Superpole, Marco kept calm despite the issue and qualified for the second session after he went out with just a few minutes to go. At the end of Superpole he had finished fifth. His feeling with the bike is very good and I am confident that he will have a good race. For Chaz, his weekend started today because of his crash yesterday, so it was like he missed a day. After the accident he was a little bit nervous and in Superpole he made a mistake but he is riding well. He is improving his feeling with the bike and tomorrow, he will do well. We expect five or six riders to be competing for the victory, so it will be two challenging races. “With Marco, we have been working during the second qualifying session this morning and the free practice session on improving the bike step by step. We were confident that if we did this then it would be possible to qualify within the first two rows. We achieved our target, even if the first Superpole session was a little thrilling due to a small technical issue. I must say thank you and well done to the crew, because they were able to fix it in time. With Chaz, after the big crash he had yesterday, we caught up most of the lost time and set the RR up for the Superpole. He also improved over the course of the day and we could see that he was pretty fast on a race tyre in Superpole 1. In the end he was not lucky but we are confident that tomorrow he will be within the top group.